In 1861 Robert appears in the census as a Confectioner in Syston High Street, but in 1851 he was unmarried in the family home in Town Green. 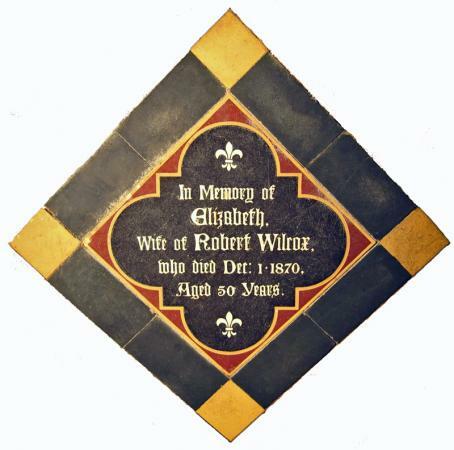 There is a headstone in the churchyard that bears 'affectionate remembrance' of Robert and his wife Elizabeth. The evidence of his marriage and the birth of his School Teacher daughter Fanny Catherine show he must have moved around a lot. Corby born widow Elizabeth Grocock brought a three-year-old child Charlotte Grocock and a five-year-old Mary M Grocock to her marriage to Robert Wilcox in 1852 at Liverpool. In 1851 she was running a shop in Upper Brown Street, Leicester. Their own daughter Fanny was born in Birmingham. The Church burial register notes that her abode at death was 'Leicester'.